If you're adding a new addition to your crabitat, congratulations. Hermit crabs are very social guys and though it may take a bit of time, they'll enjoy having another mate to pass the time with. They'll have to work out their pecking order and the newbie will have to adjust to a new, improved environment. If you're expanding your crabitat, it likely means that hermit crab stewardship is agreeing with you and your crabs. Chances are good that your new crab is going to experience a significant change in environment, most likely for the better. Often pet store hermit crabs aren't kept in the best of conditions because many people don't understand their special needs. Given the turmoil your new crab's experienced, you'll want to proceed with caution when you introduce him into the crabitat. Hermit-Crabs.com recommends giving your new guy a bath in water treated with Stress Coat, a water conditioner designed to decrease stress. He'll appreciate having his shell cleaned; it's common for pet shop hermit crabs to have dirty shells, inside and out. If his shell is coated with any dirt or slime, clean it with a damp dish towel, but don't use soap. Though he's all cleaned up, don't be in a rush to introduce your newbie just yet. He's had a major life change and will benefit from some time alone to get used to being away from his previous pet store life. Keep him in an isolation tank for a few days, or even a few weeks, depending on how he's responding. Sudden temperature and humidity changes can be stressful for him, so gradually adjust the isolation tank to reflect where he was to where he will be in the crabitat. For example, if his pet store tank was at 50 percent humidity and yours is 75 percent, increase the humidity level in 5 percent increments every few days. It's also a good time to give him lots of food, fresh and salt water and a variety of shells to consider. After a few days or weeks, your newbie should be spruced up and more relaxed, a good time to introduce him to his new family members. Place him in the crabitat and keep an eye on the other crabs to gauge their reactions to him. You'll probably see some territorial behavior, which is natural because the established hierarchy is being challenged by the new neighbor. Antennae wars are normal, as are leg sparring matches. Crab colonies are quite social and will work out their pecking order in due time. Aggression among crabs is usually limited to shell fights or because a crab smells like new molt. 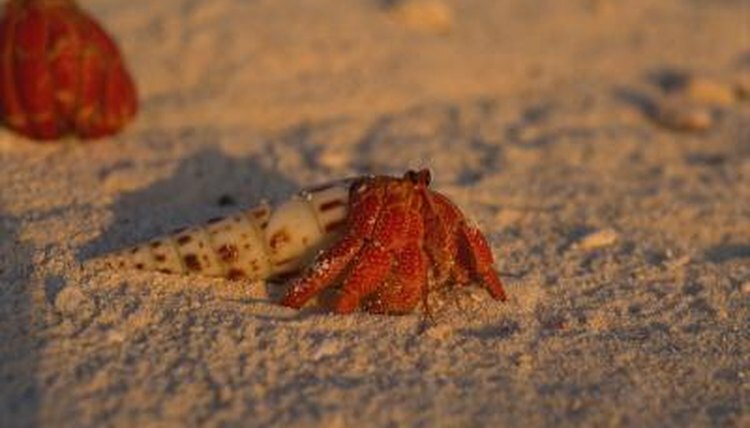 What Happens to a Hermit Crab if Its Claw Comes Off? What Would Happen if You Dropped Your Hermit Crab? What Happens When Hermit Crabs Get Stuck in Shells?